XAMPP offers one-click installation of the software stack comprising Apache server, PHP scripting language and MySQL database on your Windows, Mac, Linux or Solaris computer. The stack comprises several other handful services and applications too. XAMPP essentially functions as a complete development server that’s also easy to install. Besides the aforementioned tools, the server also packs in phpMyAdmin, Mercury mail server, FileZilla FTP server, JSP server Tomcat and Perl programming language. The server’s home page is an admin site that lets you check server security and overall status, launch applications such as Webalizer analytics and phpMyAdmin, and also view PHP demos. The installation doesn’t require any configuration and the process can be wrapped up within 10 minutes. The server, in fact, proves setting up web servers need not be complicated. This makes it ideal for people wanting a full-fledged, holistic development server that runs quickly and effortlessly. XAMPP’s control panel is easy to use, which lets you interact with modules such as Apache, Filezilla, and MySQL; view port and PID numbers; view logs; and edit configuration files. The user-friendly interface clearly shows it has been designed keeping the developer’s requirements in mind. XAMPP has a large community that constantly works on enhancing the tool and also provides solutions to user doubts and queries. You can visit its forums to get common questions answered and follow the team on social media to learn what’s new and trending. 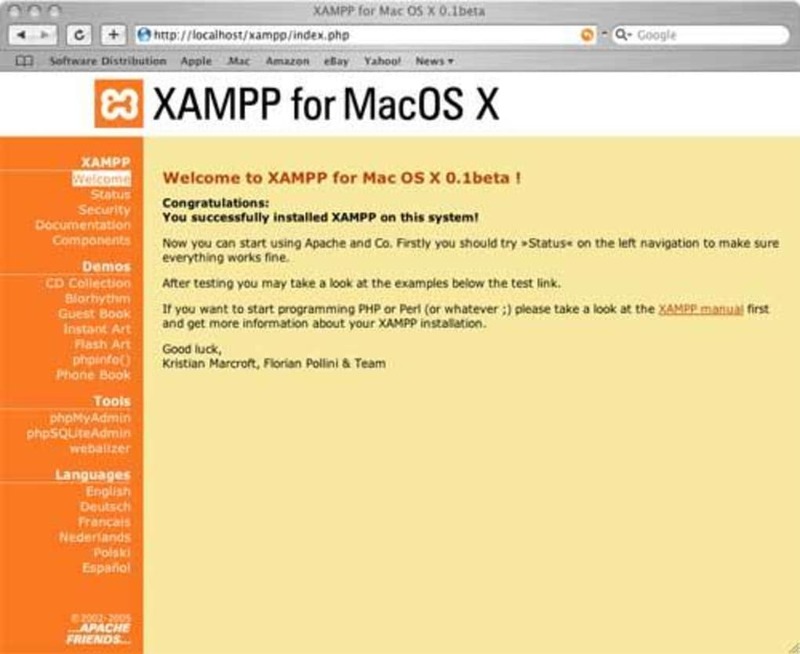 XAMPP for Mac OS X is the simplest, most practical and most complete webserver solution for Mac OS X. The distribution includes an Apache 2 web server, integrated with the latest builds of MySQL, PHP (both 4 and 5) and Perl. It comes as a Mac OS X Installer package which contains all the necessary files and requires no dependencies. If you are an experienced web developer or a Mac enthusiast who needs to run a webserver, create dynamic webpages or use databases, this is your lucky day! coz I can use database with that easily and I love it anyway beacause it is also user-friendly.